Workshop gives foreign clergy sure footing as they begin ministry in U.S.
ST. MEINRAD, IND.—A group of 14 priests sat around tables, sharing stories and laughing together. Some would stop mid-sentence to mentally translate from their native tongue into English. Each understood the struggle of learning an entirely new culture. “American coffee is very different from Italian,” explained Father Daniele Criscione, a native of Sicily, on Oct. 19. He had only been in America for two weeks. “I miss it, so much,” he said, prompting laughter from the whole room. Father Crispine Adongo, who grew up in Kenya, spoke of the difficulty to execute as simple a task as bathing. “I turned the water on, and the water is not coming from the shower, it’s coming from the spout with the tab,” he said, relating that he had to seek out another priest to show him how to operate the shower. “I’m struggling here, how do I make this water come from above?” he laughed. 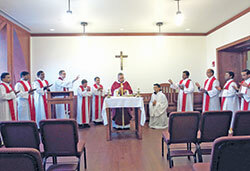 The men were gathered for a weeklong conference called the World Priest Workshop. Hosted by Saint Meinrad Seminary and School of Theology in St. Meinrad, the training aims to give clergy a sure footing as they begin ministry in this country. Most of these priests recently arrived from international locations to serve in dioceses across the United States. Many of them will remain in America for four to six years. Some will be an associate pastor in a parish; others will have the full weight of pastoring a parish on their shoulders. Topics addressed during the World Priest program include the history of Christianity in the Unites States, the typical organization and tasks of an American parish, methods for ministering to different groups within the congregation, and common cultural norms in this country. “There’s a cultural difference of standard of living, or the relationship between men and women or authority and the role that the priest has in the larger community,” explained Father Peter Marshall, director of the Institute for Priests and Presbyterates at Saint Meinrad and a priest of the Archdiocese of Indianapolis. “Then there’s a real ecclesial practice difference as well, like how is Mass commonly celebrated or how does the priest make himself available to the community,” Father Marshall told The Criterion. Father Kalapurackal, who serves as the administrator at St. Thomas More Parish in Mooresville, and Father Adongo, who is the associate pastor at St. Joseph Parish in Jasper, Ind., in the Evansville Diocese, were two of the presenters. Having arrived in this country several years ago, they used their own experiences to help the new arrivals understand the cultural differences between their home countries and the United States. The workshop also helps clergy to improve their communication skills. An instructor covers non-verbal cues, teaches accent-reduction techniques and outlines phrasing that will be more familiar to their listeners. Well aware of the language barrier, one native of India shared a struggle that he encountered in an everyday interaction with one of his parishioners. “ ‘Please move to the right side the flower vase,’ ” he recalled. This led to an extended back and forth until Father Dominic finally moved the flowers. “She said, ‘Oh! Flower vase!’ ” he recalled, this time pronouncing “vase” so that it rhymed with “face.” While he finds it humorous now, the exchange taught him to make an extra effort to learn regional pronunciations. Saint Meinrad started the World Priest Workshop about 10 years ago in response to the growing number of international priests ministering in parishes in the U.S. In many dioceses, there are not enough young men answering the call to the priesthood to replace those priests who are retiring. Some bishops respond to this by requesting clergy from overseas. More than just filling a vacancy, the World Priest Workshop aims to help these men bring their own unique gifts to the Church in the U.S. For many parishioners, the presence of an international priest might be their only exposure to his unique culture. Father Adongo suggested that parishioners of Indiana can also help these men adjust to their new home. He recommended inviting the clergy for dinner or out for a cup of coffee to help these priests learn about American culture. This would also give the parishioners an opportunity to inquire about life in the priest’s home country.